If your home or office has carpeting (and in some cases, even if you don’t), a vacuum cleaner is an essential tool for keeping things clean. A canister-style vacuum cleaner is distinguished from other types of cleaners by its shape: rather than having the motor, brushes, and dirt containment all in a single unit (as in a traditional “upright” vacuum), a canister vacuum cleaner has its motor in a canister that the user carries or pulls along, with the cleaning being done by a “suction head” which is attached to the canister by a hose. Canister vacuums have all of the cleaning power of upright models, with the added benefit of allowing users to clean in tighter spaces, since they don’t require the user to push the entire vacuum into the area that needs cleaning. If you’re in the market for a new canister vacuum, here are some things to think about. Bag-lined: These canisters are lined with disposable bags, which can simply be discarded when they get full. Bagless: Bagless vacuums have smaller receptacles inside their canister that can be removed and emptied when they get full. Although slightly less convenient than a removable bag (although it’s not a huge chore to empty the receptacle), bagless vacuums create less waste and save users a bit of money over time. 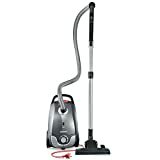 Power: Nobody wants to have to run the vacuum over the same spot over and over because it simply can’t pick up all of the dirt, which is why the best-rated vacuums all have powerful motors and suction heads to make cleaning up a breeze. Cleanup: Once the floor is cleaned, it’s important that the vacuum be easy to clean as well. Great cleaners are easy to take apart and have bags or receptacles that are easy to remove and empty. Multiple Surfaces: Versatility is one of the most important hallmarks of a quality vacuum, which is why the best ones can clean tile or hardwood just as well as carpets and rugs. 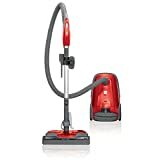 Durability: Cleaning things and being moved around a lot can take a toll on vacuum cleaner parts (especially detachable ones like the suction head), so it’s key that the cleaner be made with tough, durable parts that can stand up to repeated use, which the best models are. Canister/bag size: When shopping for a vacuum cleaner, be sure to check out its receptacle size. That way you’ll be able to find a model that will be able to handle your cleaning needs without needing to be emptied during cleanup. 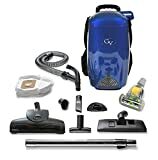 Tools: Take a moment to look at the tools and accessories that come with the vacuum. This can be especially helpful if you plan on using it to clean a particular kind of surface or material. Cord length: If you need to clean a small space, this isn’t so much of an issue. However, if your house has large rooms with a good deal of space between power outlets, it’s a good idea to look for a cleaner with a long power cord, so you can clean the entire space without having to go hunting for another outlet or extension cord. Panasonic: Panasonic is a Japanese electronics company. Established in 1918, it is one of the world’s leaders in cutting edge technology, although it also offers a wide range of home appliances and other goods which are of equally high quality. Miele: Miele is a German manufacturer of home appliances. The company was founded in 1899, and today offers accessories and appliances for virtually every room in the home. 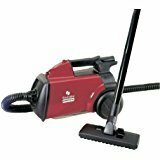 Eureka: Eureka is an American company that has specialized in producing vacuum cleaners since its founding in 1909. It has long been a leader in the vacuum industry. Electrolux: Electrolux is a Swedish appliance manufacturer. It was established in 1919, and offers (through its own brand and the many smaller companies it owns) a wide variety of home appliances, from the simplest to the most advanced. 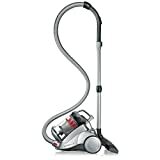 Bissell: Bissell is an American vacuum cleaner manufacturer. The company’s founder invented his first vacuum cleaner in 1876, and the business has been one of the world’s leaders in vacuum cleaner technology ever since.